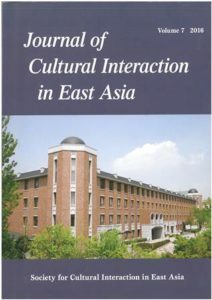 “European Art Music and Its Role in the Cultural Interaction between Japan and the East Asian Continent in the Late Nineteenth and Early Twentieth Centuries” Journal of Cultural Interaction in East Asia 7 (2016): 67–81. The fact that much of what the Japanese regard as part of their culture originally came to Japan from the Asian continent in ancient and medieval times is well known and has been extensively researched. For the period after 1868, however, the attention of scholars has tended to concentrate on Japan’s comprehensive importation of Western civilization. This exploratory article suggests a different perspective. Taking music in modern Japan as an example and based in part on the author’s research for her recent book Not by Love Alone: The Violin in Japan, 1850–2010, the author argues that music is a particularly rewarding field for examining transnational flows. Research on music in modern Japan has tended to privilege the introduction of European art music from the West and this was undoubtedly one of the most important developments in the nineteenth and twentieth centuries. There are, however, aspects to this development that merit more attention than they have received so far, including the relationship between Western music and other musics practised in Japan in the nineteenth century and the interactions between Japan and non-Western countries and in particular its East Asian neighbours. In this article, four general themes for further enquiry are introduced: 1. The possible relation between Meiji statesmen’s and intellectuals’ kangaku education and their views on the role of music in the modern state. 2. The Chinese origins and the place of minshingaku (Ming and Qing music) in the musical culture of nineteenth-century Japan. 3. Japan’s role in the dissemination of Western Music in East Asia. 4. The role of the East Asian continent (particularly the cities of Shanghai and Harbin) as a place of encounter between Asia and Europe. This article reflects on the predominance of classical music from Europe and the marginalization of Japan’s traditional music, which motivated the author to write her book Not by Love Alone: The Violin in Japan, 1850 – 2010. The triple disaster which hit Japan in March 2011 sparked off what may well be a record number of charity concerts held worldwide in support of the victims – an eloquent manifestation of Japan’s position as a global musical power. The concerts included all kinds of music of Western and Japanese origins, and the musicians came from many countries. A significant proportion of them included Japanese musicians at home and abroad playing Western classical music, thus demonstrating, once again, the well-known fact that Western classical music is also the music of Japan. Western observers have long marvelled at Japan’s success in assimilating Western music, usually without being able to explain it. Nor do Western observers who are unfamiliar with Japan always realize to what extent Japan’s traditional music has been marginalized in the process. Perhaps the most remarkable result of the introduction of Western music into Japan is the fact that to most Japanese today their own indigenous music sounds as exotic as it does to non-Japanese, indicating that within the space of a few decades Japanese musical sensibilities have changed beyond recognition. Read on here. “Introduction: Western Music in Japan: A Success Story? ” Nineteenth-Century Music Review 10.2 (2013): 211–22. The article introduces the NCMR special issue on music in modern Japan. “The European Model and the Archive in Japan: Inspiration or Legitimation?” History of the Human Sciences, 26.4 (2013): 107–127. The influence of European and especially German historiography on the formation of the modern academic discipline in Japan is undisputed, as is the importance of the German Historian Ludwig Rieß. Undeniably, Rieß contributed to the organization of the academic discipline by teaching future historians and taking an active part in the establishment of the Historical Society, as well as by the example of his own research in the history of Japan. But how significant was his influence on the establishment and maintenance of archives in Japan? Japanese scholars had been collecting and working with primary documents long before Rieß arrived; indeed, early efforts predate the measures introduced under the Meiji government. This paper will outline and assess whether Rieß and the tradition of Ranke which he represented had significant influence on existing practices, or whether he was merely used to legitimize them. Playing the violin in Japan was pioneered by women. The first Japanese to study music abroad, including the violin, were the sisters of the more famous writer Kôda Rohan (1867-1947); Kôda Nobu (1870-1947) and Andô Kô (née Kôda, 1878-1963). Kôda Nobu studied in Boston (1889-90) and Vienna (1890-95). After her return to Japan she taught at the Tokyo Academy of Music (now Tokyo National University of Fine Arts and Music). Later she opened a piano studio. Andô Kô studied in Berlin from 1900 to 1903 and likewise returned to teach at the Tokyo Academy of Music. This article describes their lives and careers and shows how their Western expertise gave them unprecedented opportunities while their gender imposed limitations. It discusses the sisters’ role in the transmission of Western music to Japan in the context of Western as well as Japanese preconceptions about appropriate musical roles for women. “Japan’s Early Twentieth-Century Violin Boom”, Nineteenth-Century Music Review, 7/1, (2010): 21-43. The flow of Asian musicians to the West has been attracting media attention since the 1960s. Among them, Japanese violinists were the first to enter music colleges and take up appointments in orchestras in significant numbers, demonstrating how successfully Japan had made the Western music tradition their own. But few people seeking to explain the phenomenon realized that Japanese had taken up the violin in large numbers already by the beginning of the twentieth century. By around 1907 Music journals were diagnosing a “violin boom”. Domestic production on a large scale, chiefly by Suzuki Masakichi (1859-1944) in Nagoya, brought the violin within reach of individuals of moderate means, and many doubtlessly saw it as an interesting Western gadget that could provide novel entertainment. One of the most intriguing aspects of the violin’s popularity was its use to play music from the repertoire of Japan’s own musical instruments, often in ensembles including koto and shakuhachi or shamisen. The “violin boon” subsided after about 1914 when the other novelties (such as the Taishôgoto) became more fashionable, but the violin has remained one of the most popular Western instruments in Japan ever since. This article describes the rising popularity of the violin in the context of the dissemination of Western music and analyses the reasons for its popularity. It also addresses the question why the violin, despite its potential for becoming part of Japan’s traditional music, did not ultimately cross the divide which to this day separates Western art music and traditional Japanese music. The “violin boom” presents a fascinating case for studying issues of cross cultural encounter and local responses to cultural politics. The Suzuki Method represents a significant contribution by a Japanese, Suzuki Shin’ichi (1898-1998), to the teaching of musical instruments worldwide. Western observers often represent the method as “Japanese,” although it could be called “Western” with equal justification. Suzuki left no detailed description of his method. Consequently, it is open to multiple interpretations. Its application, whether in Japan or elsewhere, represents an act of translation with its adaptation to local conditions involving creative processes rather than mere deviations from a supposedly fixed original. To illustrate the importance of historical context, the author discusses Suzuki’s life and work, sheds new light on the significance of his studies in Germany in the 1920s, and explains the method’s success in Japan and abroad by examining local and historical circumstances. Besides Japan, the author focuses on Germany, where Suzuki received most of his formal musical education. In contrast to other Western countries, particularly North America, the method has been slow to spread in Germany, although Japanese and Germans sometimes like to point out cultural affinities between the two countries. While this is an historical study, the suggested conclusion for music educators is that they judge the Suzuki Method on its pedagogical merits rather than on its Japanese provenance and that they continue the process of creative adaptation. “Lessons from History? – Obara Kuniyoshi (1887-1977), New Education and the Role of Japan’s Educational Traditions”, History of Education, 38.4 (July 2009): 525-543. Obara Kuniyoshi, a leading representative in Japan’s New Education movement in the early twentieth century, founded his own private school, Tamagawa Gakuen, in 1929. Although his educational philosophy owes more to contemporary Western ideas about educational reform than to Japan’s educational heritage, Obara throughout his life invoked the juku, a type of private academy prevalent in Japan until the late nineteenth century, and made “juku education” one his principles. This case study examines Obara’s “juku-myth” as a creative historical force by placing it in the context of recent discussions about social memory as a historical reality in its own right. “N.F.S. Grundtvig, Niels Bukh and other “Japanese” Heroes: The Educators Obara Kuniyoshi and Matsumae Shigeyoshi and Their Lessons from the Past of a Foreign Country”, European Journal of East Asian Studies, 6.2 (2007): 155-184. Obara Kuniyoshi (1887-1977), the founder of Tamagawa gakuen, and Matsumae Shigeyoshi (1901-1991), the founder of Tôkai Educational System (TES), were both inspired by Denmark and Danish education, although in different ways. Obara, a representative of the New Education Movement in Japan, became interested in Denmark when he heard about Danish gymnastics, which seemed to be ideally suited to his vision of rigorous but non-competitive physical education. In 1931, two years after founding his own school, he succeeded in inviting the Danish gymnast Niels Bukh and a group of his students to Japan. The interest in gymnastics sparked off a wider interest in Denmark. Matsumae Shigeyoshi’s attention was drawn to Denmark and to the Danish folk high schools as a result of his encounter with Uchimura Kanzô. Although not an educator by training, he decided to devote his life to education. This article explores the role of cultural borrowing in the thought and educational praxis of Obara and Matsumae. Although they uncritically accepted a Danish cultural memory (Denmark’s recovery from military defeat in the nineteenth century through spiritual strength and education) and cultivated a stereotypical image, the adaptation of this image to suit their own needs represents a highly creative process which resulted in two successful private schools. “Dancing at the Rokumeikan – A New Role for Women?” Gordon Daniels and Hiroko Tomida, (eds), Japanese Women: Emerging from Subservience, 1886-1945. Folkestone, Kent: Global Oriental, 2005, pp.157-177. The women who trod the dance floor of the Rokumeikan in the 1880s as part of Japan’s efforts to demonstrate to the West how ‘civilized’ she had become, most probably would have found it difficult to identify with this observation by a Scottish lady (Madame Zuingle) in 1848. But her words clearly remind us, that the ballroom demanded of women a role quite different from anything Japanese women of the upper classes had known until then. Instead of hiding away in their residence, the women of the Rokumeikan had to assume an exposed public role at the side of their husbands. Japanese Women: Emerging from Subservience, 1886-1945 is available here. “Woman Educators and the Confucian Tradition in Meiji Japan (1868-1912): Miwada Masako and Atomi Kakei”, Women’s History Review 10.4 (2001): 579-602. Historians of the women’s movement in Japan tend to equate the women’s movement with opposition to the state and with Western liberal thought. Consequently, women who played a public role and contributed significantly to the modernisation of Japan, but who supported the imperial state, have received little attention. This article examines the life, thought and activities of Miwada Masako (1843-1927) and Atomi Kakei (1840-1926). Both were educated in the Confucian tradition and were among the first to promote education for girls, establishing private schools for girls in Tokyo which still exist today. Although they did not fight for women’s rights in opposition to the state and were not led by Western ideas, they helped redefine the role of women, linking it to the well-being of the nation. Thus, they contributed to creating a society with increasing opportunities for women. “History and the Nation in Nineteenth-Century Japan and Germany”, Senri Ethnological Studies 51 (2000): 1-17. The emergence of history as a professional academic discipline in its own right in the nineteenth century is closely linked to the rise of the modern nation state. This is particularly evident in the case of Japan and Germany. The German Empire was founded in 1871, the same year the Meiji government achieved control over the entire country by abolishing the feudal domains and establishing prefectures (haihan chiken). Germany provided a model for Japan in many areas, including historical scholarship. However Japan did not merely follow Germany; developments in both countries were often contemporaneous, as both countries faced similar challenges: a newly-formed nation state that had to be filled with meaning for its citizens and define its position on the international scene. This paper will highlight some of the similarities and differences between the two countries. It will also argue that, unlike their German counterparts, Japan’s first academic historians did not ultimately become interpreters of the nation, because they failed to find a way to write history that reconciled their commitment both to historical truth and to serving the nation. “Chinese Learning (kangaku) in Meiji Japan (1868-1912)”, History 85 (2000): 48-66. Japan’s development since the middle of the nineteenth century is usually summarized under the headings ‘modernization’ and ‘westernization’. Such a perspective neglects the importance of indigenous traditions in the shaping of modern Japan, including Chinese learning (kangaku), which had been thoroughly assimilated and had formed the basis of the dominant ideology in the Tokugawa period (1600–1868). The leaders of the Meiji restoration of 1868 all had a kangaku education and their ideas were heavily influenced by it. Kangaku continued to play a dominant role in Japanese culture until well into the Meiji period and did not fall into decline until the mid-1890s. The main reason for this was not contempt for contemporary China in the wake of the Sino-Japanese war (1894–5), as has been argued, but the new national education system which stressed western knowledge. It was not a sign of waning interest in China, but of new forms this interest took. China became the object of new academic disciplines, including tôyôshi (East Asian history), which applied western methods and a new interpretative framework to the study of China. “The Mid-Meiji History Boom: Professionalization of Historical Scholarship and Growing Pains of an Emerging Academic Discipline”, Japan Forum, 10.1 (1998): 67-83. In January 1893 the journal Waseda bungaku diagnosed a ‘history fever’. The term described an increased preoccupation with history among the educated public, which found expression in books and articles and a number of new history journals. Although this ‘history boom’ was part of a long-term phenomenon, the early 1890s were remarkable in two ways. First, the intellectuals representing different generations, educational backgrounds and disciplines were involved in heated debates about how history should be studied and represented. Second, the commentators reflected on the boom and its aftermath with striking self-consciousness even while it was in progress. Over the next months Waseda bungaku and other publications reported regularly on the boom and the debates it generated. By summer 1893 its climax had passed and the same journals spoke of a ‘desolation’ that history was falling into and discussed its reasons. This article traces the ‘boom’ and following ‘desolation’ as experienced by commentators mainly in Waseda bungaku, Shikai and Kokugakuin zasshi and explains it by placing it in the context of the emerging modern nation state and the formation of the professional academic discipline of history. “Suematsu Kenchô in Britain, 1878-1886”, Japan Forum, 5.2 (1993): 173-193. Suematsu Kenchô lived in England on two occasions; from 1878 to 1886 as a secretary to the Japanese legation in London and a student at the University of Cambridge and in 1904-1905 to win European sympathy for the Japanese cause in the war with Russia.